Saggy cushions is a common problem in old sofas. You could stuff your cushions with foam to make them firmer and newer-looking! This can be done for seat cushions with zippers. And here’s another way to stuff your sofa cushions, with quilt batting and spray glue. Or you could fix saggy back cushions by adding buttons! So clever and they will give your sofa a more modern, tailored look. An easy way to freshen up the look of a worn-out sofa is to buy or sew new pillows in fun fabrics. If your old sofa came with boring matching pillows, reuse them and cover them with beautiful fabric! Long lumbar or bolster pillows in a gorgeous floral or patterned fabric can do a lot for a simple and neutral sofa! Or you could replace the back cushions, especially if they’re crumpled beyond repair, with new pillows that fit the space. And don’t overlook another great tip in the link below: remove or staple back the skirt on a sofa for a more modern look. 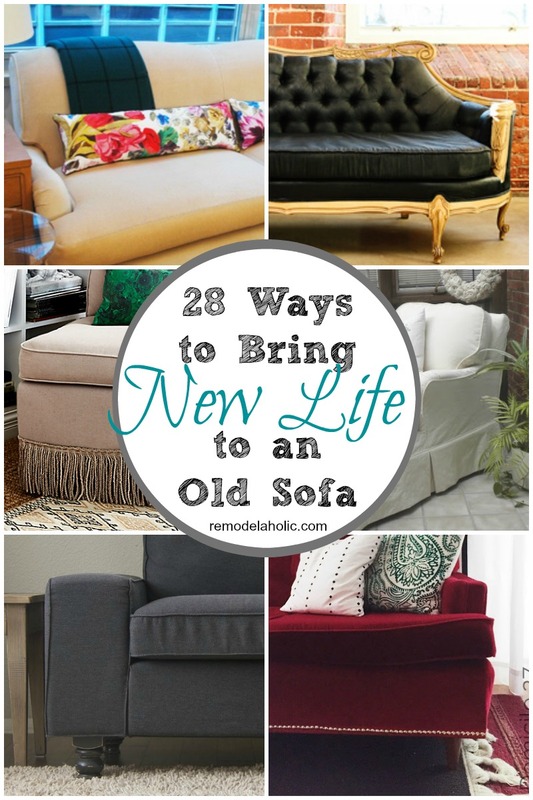 Next up, 16 ideas for painting, reupholstering and adding slipcovers to sofas. This method worked wonderfully for me. So grateful for your post! So glad to hear, Lisa! Thanks for the comment! I love all of these ideas! My favorite was probably the one with the button. I’m going to have to try that with my older couch.